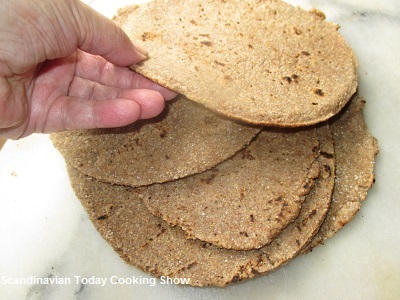 Flatbread (flatkökur or flatbarud in Icelandic or pottbraud) is the oldest type of Icelandic bread. The tradition of baking flatbread in Iceland dates back to the settlement in 874 AD. 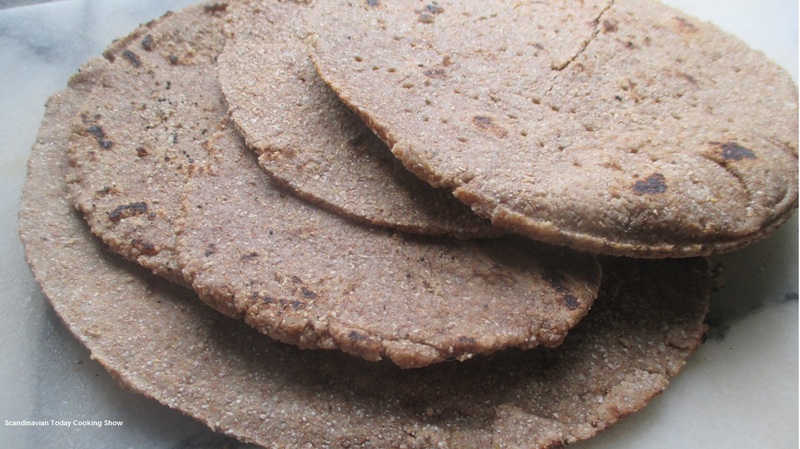 Flatbread is especially popular in Iceland during the mid-winter festivals called Thorrablot during the month of Thorri, which are held in Iceland during January and February. The Thorrablot begins with Husband’s Day and ends on Woman’s Day. The Flatbred can be bought in every grocery store in Iceland, and it is most often served with butter, smoked lamb, smoked salmon or trout. Combine and mix together the following, rye flour, salt, baking powder, and gradually add the boiling water. Knead the dough firmly to a smooth ball without cracks and does not stick to the counter. Roll out the dough till approx. 2 mm thick. Place a plate on the dough and cut it out to round cakes. In order to prevent air bubbles to form on the flatbread you pierce it with a fork. Heat a hotplate or frying pan (without any oil or butter) and bake each cake at a very high temperature until there are black spots on the side, which is facing down. Then flip it and bake it on the other side, till it also has black spots. Quickly dip the flatbreads into lukewarm water. Stack them under a damp cloth to prevent them from drying out. Enjoy the flatbread with your favorite topping. 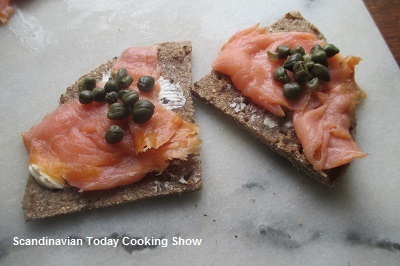 We served the flatbread as appetizers with smoked salmon and capers.